Russia's President Vladimir Putin surprised the audience during a meeting with students at Moscow State University, as he began singing along to the tune of a Soviet song celebrating the USSR's achievements in space. 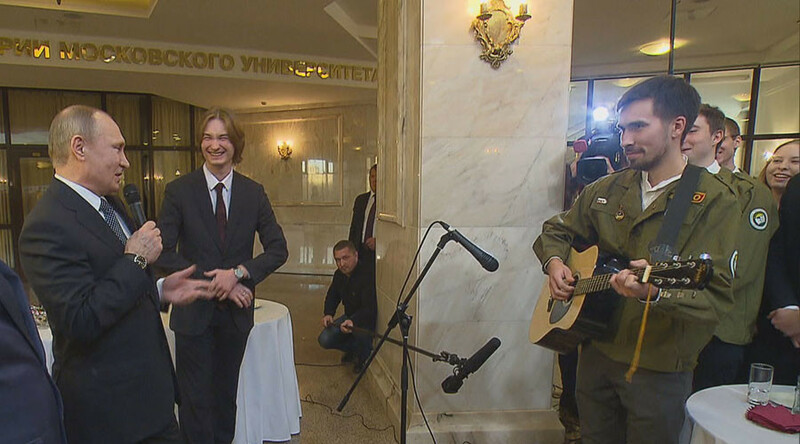 “On dusty paths of faraway planets our footprints will remain,” Putin sang, when a student with a guitar apparently got too nervous performing for the president and stumbled with the lyrics. The song, ‘14 Minutes Till the Launch’, was a hit in the 1960s, especially after Soviet cosmonaut Yury Gagarin became the first man to travel into space. Putin was visiting the Moscow State University on Wednesday in honor of Students’ Day, widely celebrated in Russia on January 25. It’s not the first time the Russian leader has demonstrated his vocal abilities. In 2010, then serving as prime minister, Putin famously took to the stage at a charity fundraiser. With the audience packed with international celebrities including Kevin Costner, Mickey Rourke, Sharon Stone, Kurt Russell, Monica Bellucci, Ornella Muti, Goldie Hawn and many others, Putin sat at the piano and played the beginning of Blueberry Hill. He then took the mic and sang it in English.